How we treat animals matters. Reading The Kind Diet by Alicia Silverstone was when I learned about the atrocities of factory farming in its current form. I admire Alicia for the way she presented veganism as making the healthiest, kindest choices we can, and reading her book made me go vegan almost overnight. Even though I am not vegan, I feel grateful to have the consciousness to care about where my food comes from, especially animal products, and the ability to make other choices such as using personal care products that were not tested on animals. Eat more vegetables. It was only a few months after I went vegan that I was introduced to Dr. Fuhrman’s book, Eat to Live. At that time, I was suffering from chronic migraines. Reading his book inspired me to further transform my diet and that’s when I got rid of the processed foods and started focusing on adding more vegetables into my daily routine, especially the green leafy variety. Prepare your own food. One way or another, our fast-paced modern life has taken us away from one of the most basic joys in life: preparing food. From gathering the ingredients to chatting with others about various preparation techniques to sitting down with friends and/or family over a lovingly prepared meal, this process is essential to our well-being and can get easily sacrificed for convenience’s sake. Being vegan and a nutritarian put my cooking skills to the test and that’s when I learned so much about food and the traditions of how it is grown, harvested, prepared and served. Be part of a loving, supportive community. For various reasons, I’ve never felt part of a community before and it was awesome to immediately connect with diverse people from all over the world who shared my same values. It made me sad to not be part of that community once my needs changed, but I know realize how important to human emotional health it is to feel connected, and so I am taking care of myself that way, joining new social groups and building relationships with people who love me for me, vegan or not. Everyone has different needs. I’ve been learning about health and nutrition for over a decade now, but it was only when my health was suffering very seriously despite doing what worked for others within the vegan definition that I realized how different we all are. Food can unite or divide. Having declared myself a vegan and then having to back away from it, I’ve learned my lesson about judging other people’s food choices and recognize that it is a complex personal decision, similar to our spiritual or political beliefs. Each of us bears the responsibility to let our choices unite or divide us. There is more than one way to do good. Studying public health was overwhelming in the sense that there are no easy answers for the very serious problems that exist. The only way I could move forward in my studies was to recognize that it’s not my job to fix everything. It is my job, however, to use whatever time and talent I have to leave the world a better place. 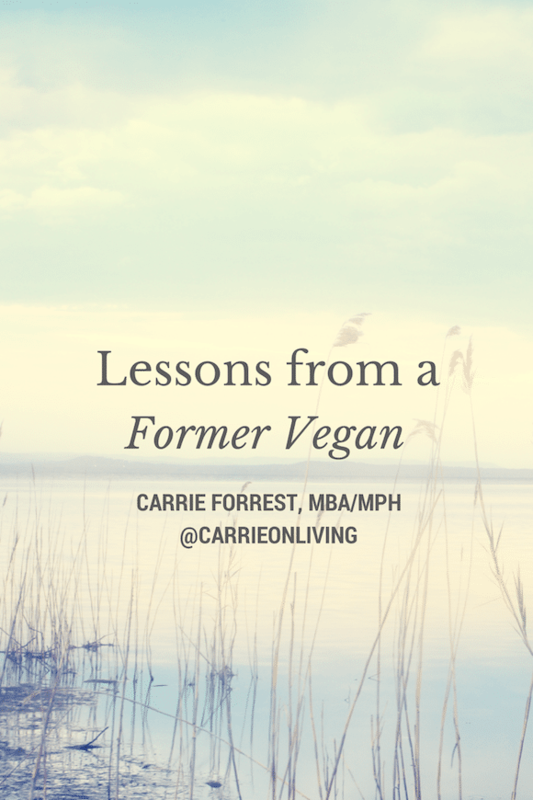 Obviously, promoting veganism was an important part of my journey, but it ended up being only one part of my life. I have more gifts to share and believe I can and will do good. Labels can be harmful. One of the negative aspects of veganism is that it is a very black and white definition, or at least it felt that way to me. I take responsibility for having tried to be vegan and promoting veganism in the way that I thought best, but now I see that labels or roles that have strict definitions can be harmful when they no longer fit your needs. As I move forward, I am taking care to not define the way I eat or live outside of what is balanced and healthy for me. Taking care of yourself is your most important duty. I can see now that there were clues that some of my health issues were diet related, but I refused to believe it for at least a year. Doing what needs to be done for my physical and emotional health is my top priority because nobody else will do it for me. My father died from severe physical and mental illness and I decided that will not be my fate. Since being 100% vegan was not sustaining my physical or emotional health, I had to make the decision to change my course based on what I thought was best for me. Kindness is everything. Part of being human is that we have our own opinions that may differ from others. It is natural to judge someone else for being different, it is a natural defense mechanism. But, just as it is vitally important to treat animals and our environment with respect, I believe it is equally important to do the same for our fellow human beings. When you feel the urge to judge or give someone a harsh word, imagine that you are speaking to someone you love and realize that you can’t possibly know what the other person is going through. We’ve all gone through changes and overcome obstacles in our lives. Maybe you are currently experiencing a hardship that is more difficult than anything I could imagine. Or, perhaps you are blessed with good health, loving support, and incredible opportunities. Whatever the case, let’s take a moment to be thankful for our abilities to heal and grow and to feel gratitude for the experience of being wonderfully, imperfectly human. Want more inspiration for healthy, balanced living? Follow me on my social media accounts @carrieonliving: Facebook, Instagram, Pinterest, and Twitter. I was never fully vegan, but got really into raw and plant based eating for a while. I relate to so much of what you said here! The biggest lesson I have gotten is that there’s no “wrong” way on the journey—it’s a process of discovery that changes constantly. I’ve learned not to judge anyone else’s journey, and I’m dedicated to being aware and conscious of my own path. Thanks for sharing your journey Carrie! Thank you for your comment, Lisa! I stopped reading your blog for about a year when I was vegan because I disagreed with your point of view. It was so hard because I admired you and I had previously loved reading your posts. I did exactly what I am cautioning against now in letting what I thought was best color my perspective of you and your journey. I’m just so glad I never made an ignorant or hurtful comment to you that could have irreversibly damaged our relationship. Now that I’ve come out the other end (of what, I don’t know, ha ha, bad joke), I feel grateful that I have a better ability to reserve judgment. So, even if you wrote something on your blog that I vehemently disagreed with, I would still appreciate that it’s your journey and not mine. I’m using this as an example, of course. I think you’re awesome and fabulous, and send you lots of love and support. Xoxo. Carrie, I’ve followed you a little bit over the last year or so from Eat to Live. I was a vegan for about 2 years. Recently I stopped being vegan and started eating meat again. I feel so, so much better. I think that we are all on our own journey. I really had to listen to my body because I just felt bad after two years of eating vegan. Now I feel a little embarrassed to tell people that I’m eating meat again, but I hope that I can still eat a healthy diet and do better than most people out there. All I know is that I feel so much better. You really do have to take care of yourself. Hi Kim! Thanks for the note and for your honesty. I know, it’s awful to go back on something like that, especially where there is that moral element. But, being kind and forgiving to yourself is so important, as well as giving your body what it needs. I support your decision and admire you for being open to change. Great post Carrie! I agree with you so much on the labels thing. I try really hard not to use the word “vegan” in my speaking or my blog- even though thats how I eat/cook 98% of the time. I think using labels creates an expectation. I love the Kind Diet! While I was vegetarian most of the time before, reading that book gave me new insight into the dairy/egg industry and I love the way Alicia writes! Thanks for your thoughtful input, Alex! I find it so tempting to put labels on things, it makes it easier for me to understand what’s going on. But, I’m learning how vastly complex this world is, let alone our individual bodies, so I agree that it’s better to stay away from the hard approach and try to be realistic about it all. Have you read The Kind Mama yet? I haven’t, but I bet it’s awesome, too. Great post! I try to live by all 10 lessons and loved seeing them written down like that. Thank you! That means so much to me, Helyn, especially coming from you, my talented writer-friend. Thank you. 🙂 P.S. Thrilled to read about your venture into e-books!!! I have been following your blog for quite awhile. Love your recipes. And your honesty. I think all of us follow different journeys. I have been a lacto-ovo vegetarian for many years. I am now transitioning to vegan, for both spiritual and health reasons. But it has been a long journey, and it is my own. My husband is an omnivore; my mom, due to health issues, is vegetarian (almost vegan, but will eat items like bread that contain eggs or dairy). Your rules are great; they made me think about how and why I am doing what I do. Thank you, Ceil!!! Your kind words are much appreciated, as well as learning about your story. My diet is definitely in a transition phase where I’m testing different foods and seeing how my body reacts. It’s a long, tough process, but it’s worth it to feel good. Sending you my continued very best. Xo. Thank you, Kelli! I love your openness and honesty, plus an understanding that nobody is perfect and that circumstances do change. Sending you much love and respect back. It’s amazing to me that all these former so called vegans seem to use the same template. Thanks for setting animal rights back. I might have some respect for you if you tell me you are going to a farm and yourself slitting the throat if the ‘happy’ animal you are listening to your body and eating. The health problems espoused by former vegans are not related to veganism but rather to extreme, restricted plant based diets. Why not call yourself formerly plant based and tell us how you still won’t buy leather? That you still don’t buy animal tested products? You could use your platform to get others to help animals in some small part rather than just ‘listening to their bodies’ and living in denial. Stephanie, there are so many constructive ways to use your angst. I would encourage you to spend time with people that need a listening ear, or someone to care about them. They exist everywhere. In a more perfect world we can then worry about leather shoes. I see what you are saying, and agree that we should be kind and compassionate towards each other. But can’t we also worry about issues like leather shoes? The two things aren’t mutually exclusive. Great lessons, well written. It’s amazing how much food choices anger and divide us. My good friends, when they were vegetarian, decided after several years of difficult times at family gatherings, that “people are more important than food” and that they would eat what was being prepared rather than set themselves apart and cause problems. It was their personal decision, but it’s a lesson that has hit home with me. I admire the grace with which you are embracing your journey and sharing it with us. Wonderful post, Carrie! I, for one, am so glad to have shared part of this journey with you! Please don’t listen (or read) any hurtful posts. I totally believe in the concept of “walk a mile in my shoes”! Until someone is able to do that, they have no basis on which to pass any judgments! I continue to work on being vegan…..and it is difficult to do in a family that loves meats and processed foods. However, I do backslide from time to time when temptation takes hold of me. But reading your blog STILL helps me!! Thanks for sharing your journey with us. It takes great courage for you to do this when you open yourself up for others to say hurtful things. The “kind diet” doesn’t necessarily help people to BE kind, does it? Thank you for your wisdom and honesty, Sallie. Your thoughts regarding the Kind Diet made me smile and think that there are a lot more considerations than food and consumer choices that encompass what defines it. I also appreciate what you said about not considering the negative comments. My skin has gotten a lot thicker in recent weeks, although I still a very sensitive soul. I like to give space for all opinions, but I choose not to respond to comments that are just meant to express anger or frustration. Well I certainly have been educated today! I have been slowly over the past two years converting myself and my family to a more whole food plant based lifestyle. It has been a difficult process due to my family situation. But I really appreciate the post by Stephanie because she really opened my eyes to the proper vegan life. First I would never take a life or attempt it to survive under any circumstances. So i understand from Stephanie that we are to be kind to animals but we are to be cruel and unkind to our fellow humans who do not agree with what we believe is to be correct and right. I thought that was called Racism! Well I don’t want to be a part of that! I truly feel you have to be kind to other people, and teach our children how to be respectful, kind, and compassionate even if we don’t agree. That respect and compassion will follow into other lives and into our animal kingdom. I choose to be kind to ALL life. Shame on you Stephanie. Bravo, Patty. So well said! So glad your doing well and love your new blog/web sight very appealing and user friendly:) I can relate to so much of what you have been through and where you are now. My daughter went Vegan for a short time mainly because of allergies to many foods, but she is now eating fish and occasional eggs(egg whites, seem to be okay so far) anyways I’m starting a new journey as well. I am enrolled in a new online nutrition course starting in mid september and so excited something i been wanting to do for over 5-6 years but the timing was not right at that time of my life. any ways love reading your posts and hope we can get together soon….!!!!! This is such a great post and things to think about, for anyone. I especially agree that labels can be harmful. It can be stressful to try and be the “perfect” vegan or perfect anything for that matter. Beautiful, thoughtful post, Carrie. As always. Ah, labels. Isn’t it odd that we as human eaters feel such a strong need to classify our food choices and make decisions about all future meals from now until forever? (We’d never dream of publicly declaring that we will only wear the same type of clothing or shoes, read the same type of book, even live in the same type of house for the rest of our days, yet for some reason, no one balks an announcement that one has assumed a specific way of eating and are now expected to maintain those parameters forever.) There’s a lot of security to be found there, I suppose. I know that for myself, I’ve always taken a lot of comfort in setting rules, and then following them “perfectly”. Thing is, at least for me, those dang rules are meant to be broken and I believe that creating these strict labels for myself contributed to my downward spiral of severely disordered eating. Looking back, I think had I just taken it meal by meal (bite for bite, even!) and simply let myself explore what tasted good and felt right to me at the time, I may have saved myself several years of suffering. Anyway, tangent. (Sorry.) Looking forward, no one is perfect. And there is no “perfect” way of eating. Like you say, “everyone has different needs” and I truly and deeply believe that. And our individual needs will undoubtedly change and evolve as we pass through different stages in our lives. Therefore, the goal just can’t be perfection; because perfection simply doesn’t exist. All we can do is be true and kind. Especially to ourselves. You’re so wise, Hilary, and I really love your insights. I definitely find safety in making declarations related to all sorts of things. But, you make a good point about how unrealistic it is to say that we’re going to do ANYTHING forever, let alone dietary choices or parameters that really should change as our bodies change over time. I love your idea of taking it one day or bite(!) at a time, that makes so much sense to me. I have another friend who reminds me that “perfection is misery” and I try to remember that and just be kind to myself and appreciative that I generally try to do my best and that is the most I can ask of myself. Xoxo. I loved this post! I have been vegetarian, then ate chicken during my pregnancies (it was all I wanted!) and then became mostly vegan. I have never been able to be totally vegan, I will never give up baked goods and chocolate 🙂 but the main meals of my day are vegan. I have noticed recently cravings for things with higher protein contents, like eggs, Greek yogurt and even veggie products that I previously gave up because they are so processed. I haven’t been eating these things but am wondering what may be missing that my body is craving it so much. I don’t want to pry so I understand if you can’t comment, but I was curious if you discovered something specific missing from your diet and how it helped you to add these non-vegan things back in. I notice feeling tired a lot, sometimes very grumpy and of course the cravings I mentioned. Just curious if you had some feedback. I totally love and admire your openness and genuine nature in all of your posts on your journey. Yay for you for listening to what your body needs! Just so you know, baked goods and chocolate can be vegan. I just had some awesome vegan chocolate! Hi Maren! Thanks so much for the note. I had so many different conditions going on that it’s hard for me to say what nutrients I was deficient in. I am definitely willing to go into detail with you, but I’d probably feel more comfortable discussing over e-mail, so feel free to shoot me a note. Dr. Fuhrman let me know that he has worked with some patients who have become B12 deficient despite blood tests within normal parameters, and zinc deficient as well (blood tests don’t measure that very well). Oh friend, just keep being YOU!! In fact, we all need to be our own unique selves and stop feeling that we have to label every little thing. There is so much pressure these days. It’s time to start respecting each other and try to understand what the individual is going through. If you can’t do that, or take the time to understand the struggles people go through in making these choices, then keep the unkind words unsaid. Simple as that. I wish these communities would be more accepting, but in the grand scheme of things you have to ‘do you’, you have to listen to your own body and your own inner self. Trust that it will get easier Carrie. I’ve read the onslaught of comments (especially on FB) and I think you are handling yourself very well amongst so much scrutiny. I wholeheartedly agree with you, the moment I had to make the tough choices in how I approached food and healing, I started having more compassion for the lifestyles of so many others. Let’s leave the judgement aside and embrace out differences. Just know that there are so many who love, admire and support you! I’m friends with so many vegans and something I immediately love about them is not having to worry about what to make for them that they will enjoy or choosing a restaurant to eat at with them. What I love even MORE are my non-vegan friends who are fine with my eating decisions and are so incredibly accommodating by making “Kimmy-friendly” food and restaurant choices. I am not sure if I will ever not be vegan, but I can certainly appreciate others choices. I’m happy that I am not and never have been a “judgy” vegan. Life is too short, people need to make their own decisions and do their own thing. You hit #8 dead on – I am way too quick with labels as I think it’s easier… it sometimes makes things much more difficult. Kimmy, you are such a wonderful friend and I am so happy that our ability to communicate and hang out surpasses our differences. You are a wonderful example of a loving, kind, compassionate vegan: the very traits that drew me to the movement in the first place. Thank you for being so awesome. Xoxo. Thanks for sharing these words of wisdom. I try to eat a plant-based diet. But occasionally I feel like I can’t handle anymore legumes–digestion-wise–and will eat an egg. Then the cheese on pizza margherita wins me over and I have some. I really do think that I feel better when I very carefully decide about all of my food and am making sure to get all of the necessary nutrients. But sometimes I am overwhelmed by the work. I appreciate your honesty! I hope you continue to be healthy! Thank you, Dawn! I agree, my digestive system is pretty sensitive and I didn’t realize that I likely wasn’t getting enough nutrition because of it. Adding some animal-based foods has helped tremendously and I’m feeling so much better. I appreciate the kind and supportive words. Xoxo. Well, I’m so glad you’re feeling better, Rackell. I can identify with some of the issues you related, including the new allergies that appeared during my 3.5 years as a vegan. I am very well convinced that we all have varying needs. I’m also finding that I’m not super tolerant to dairy anymore, but I enjoy some homemade kefir in small quantities now. Sending you much hope for continued good health and appreciation for your input. I have been vegan for little over 4 months and veggie for 3 years prior – but completely love everything you’ve said here and how honest it is about what being a vegan means and the trials of it. I’m very lucky as my mum used to be vegan so has tips and tricks to help me out whenever it is tough, which tends to be often, but I find it so rewarding as for me it is kindness motivated not only towards animals but towards my own body as well (kind of my body is a temple thing, you know?). These lessons are extremely helpful and is something I can always relate back to! I praise how you’ve portrayed that being healthy is the choice, rather than being vegan and for me it’s a big thing that I don’t come across as forcing my opinion or beliefs, about veganism, on other people which seems is exactly what you’ve done also. Thanks so much for your thoughtful words, Anouska. Sending you the very best for much continued health and happiness. Xo!!! I was desperately looking for exactly this sort of post somewhere in the atmosphere at six am and here you were. While it is an old post, it has given me peace and I want to thank you, dear stranger. I was strictly vegan for two and a half years and am now mostly vegan. I hate the labels but it’s a way of clarifying my situation I suppose. I’ve been struggling with loads of guilt over my occasional consumption of dairy, but I was feeling sluggish, angry and deprived on my strict vegan path. The lessons I’ve learned over the last nearly 3 years (next month), have forever changed me for the better in countless ways and I agree that it is a journey and it’s different for every single person. Thank you for posting such an honest piece of you, dear stranger. Acceptance and tolerance is what this scary world needs. Angelica, I’m so grateful for your message because it helps me feel as if sharing my journey has helped someone else. Thank you. I don’t like labels, but I am comfortable with nutritarian. To me it means I am making a conscious effort to put nutritious food in my body. Thank you for sharing your journey with us. Thanks, Dee Dee!!! I agree, labels are hard, but it’s also nice to identify with a community or a set of principles. I’m so happy you found one that you feel comfortable with. XOXO!! !